Based on a free comic book I received from a guy who was practically about to throw it away, I ended up going to the comic shop and picking up the next issue, Thor: The Mighty Avenger #2. Let me paint the picture in which this Thor book resides. Have you been reading any of the recent Thor or Avenger titles involving Thor? Yes? Well, this is nothing like any of them. Thor: The Mighty Avenger takes place in it's own Marvel continuity. It involves other Marvel characters, such as Hyde in the comic of the day, but it stands apart from normal continuity and the main stream Thor books. In Thor: The Mighty Avenger #2, Thor tells Jane Foster that he can not get back to Asgard and that he doesn't know why. It seems much like the plot of the upcoming Thor movie in that he seems to have an uncontrolled reckless rage at times and seems overly confident. 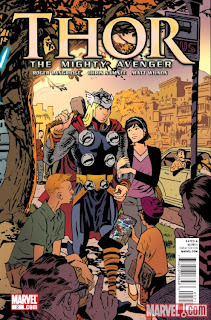 Thor: The Mighty Avenger seems like it will include mini adventures that explore why Thor is cast down to Earth, how he eventually controls his rage, but it will probably also explore his budding relationship with Jane Foster. Get some God of Thunder! Admittedly, Thor: The Mighty Avenger is not a book for everyone. It is suited for a younger comic book buyer or Thor fans just looking for some wholesome fun and whimsical art which shies away from the darker tones which the main Thor title is exploring.